When it comes to advanced technicality, Revocation are certainly one of the most popular bands that comes to mind. There have been mostly highs and a few lows in the band's catalog, with one particular low being their self-titled release three years ago. With Deathless only a year later, hope was restored to the band's faithful following; a technical album with hooks and some super album art to boot. Great Is Our Sin was then given to us 2 years later and it is primed to be Revocation's magnum opus, but is it really? Right from the gate 'Arbiters of the Apocalypse' is fast and furious and gets you in the mood to crush skulls. New drummer Ash Pearson (ex-3 Inches of Blood) makes his presence felt as he powers through the double bass pedals, behind David Davidson's powerful guttural vocals and guitar prowess. This kind of playing is advanced technically, but not so much as to turn off the casual fan, as there are hooks aplenty. "Crumbling Imperium" is a bass heavy ode to tech death, Brett Bamberger uses ample bass chords to create an ominous tone. I feel like some of the best parts of Atheist's Unquestionable Presence are being utilized here (specifically 'Mother Man') amongst the overall modern sound and production quality, not to mention an interlude which could easily be found on Cynic's Focus. There is a lot to love on this track as it constantly changes tempos and weaves in and out of technical riffs to the very headbang-able ending. Closing out the album is 'Cleaving Giants of Ice'; a song that adds more to this album's overall sheer complement of variety. Revocation have always been fans of using pieces from their favorite bands and dropping them into original songs and making it all their own and elements of Emperor-esque soundscapes sounding off beside modern thrash metal is quite a way for this album to end. 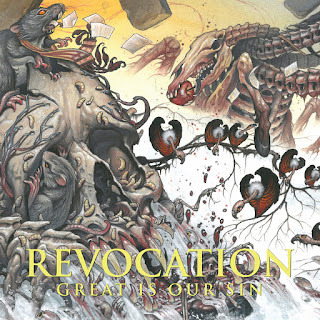 Revocation have created their most cohesive album to date with Great Is Our Sin; they have hit a stride few bands are capable of getting to and it only looks like a bright future from here.